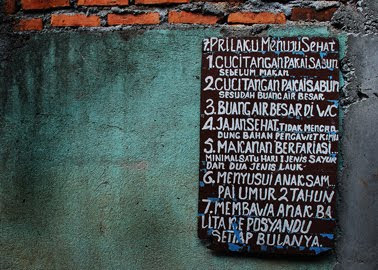 The gangs of Jakarta's poorer neighborhoods can be narrow and labyrinthine. Some are just a shoulder's width wide. Others cut right through people's kitchens. Or rather, some houses use the village path for a kitchen. "Permisi!" you call out as you pass along these pathways. "Silakan!" comes the reply, and people peer through open doorways. There are fractured kites hanging from black electricity cables above the street. There are grubby cats eating garbage. There are coloured flip-flops kicked off on doorsteps. And there are hand-written Seven Healthy Habits posters on the walls. The handwriting varies from hamlet to hamlet, but the seven rules are the same. 1. Wash your hands with soap before eating. 2. Wash your hands with soap after having a poo. 3. When having a poo, use a toilet. 4. Eat healthy snacks, not those containing preservatives or chemicals. 5. Eat a variety of things, including a minimum of one type of vegetable a day plus two other dishes. 6. Breastfeed your children until they are two years old. 7. Take your toddler to the village health post once a month. The government village health posts are called posyandu. Children are brought to be weighed and measured once a month and nutritious food may be distributed to mothers. In the village of Kembang Kuning in west Java, I met the two girls below collecting their free monthly egg from the posyandu. Raisya Bella (4 years old) is on the left and her best friend Alfahra Maudina (3) is on the right. They held those eggs so very carefully. "My dad makes oxygen masks," whispered Alfahra. "Mine makes electrical equipment," said Raisya. Gorgeous photos and really interesting post. I never realised the word for breastfeed was menyusui, but that really makes perfect sense, doesn't it? 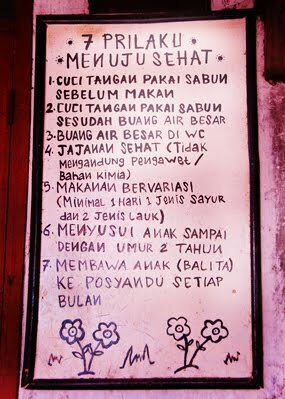 Indonesian women have a rather wry attitude towards the word susu (milk) and all its variations. In a cafe in Bali I ordered coffee. The waitress served it, placing a small jug of milk beside it. I waved the milk away, saying it wasn't necessary. The waitress chuckled, pointed to my breasts, and said, "Sudah ada," (already have).